Brian Zimmerman is the CEO of Cleveland Metroparks. William Stinchcomb served as Cleveland Metroparks founder and first park director for 36 years, from 1921 to 1957. It’s humbling and awe-inspiring that his vision stretched 100 years into the future, and the outer system of parks and boulevards is the Emerald Necklace we know and love today. The success of the Cleveland Metroparks has been built on staying true to Stinchcomb’s original vision and three key pillars of Park District’s mission: conservation, education and recreation. Over the past century, Cleveland Metroparks has not only conserved natural resources across Northeast Ohio for future generations but also worked to enhance people’s lives by connecting them to outdoor education and recreation. What began as a mere three acres of green space in Rocky River Reservation, Cleveland Metroparks now spans more than 23,000 acres of land, 18 park reservations and 300 miles of all purpose, hiking, biking, and bridle trails. More than 57% of households without a vehicle are now within a half mile walk of our park entrances. It is our goal to further improve connections from Cleveland Metroparks to urban areas and to regional recreation and transportation networks. We’ve been working towards this goal by acquiring nearly 750 acres of urban parks, and by working with partners to build expanded trail connections. An example of this is the Cleveland Foundation Centennial Trail Lake Link, which will eventually traverse 1.3-miles through the West Bank of The Flats terminating at Wendy Park on Whiskey Island. Running through Rivergate Park in Cleveland’s Flats East Bank along the Cuyahoga River, the Cleveland Foundation Centennial Trail also connects to the Towpath Trail. With access to rowing, kayaking, the Crooked River Skate Park and nearby trails, Rivergate Park has become a recreational hub of activity. Just down the Cuyahoga River, the eLCee2 Water Taxi provides a connection to and from the East and West Bank of The Flats. Looking towards the future, we’re incredibly excited for the Re-Connecting Cleveland Pathways to Opportunity project to come on line. 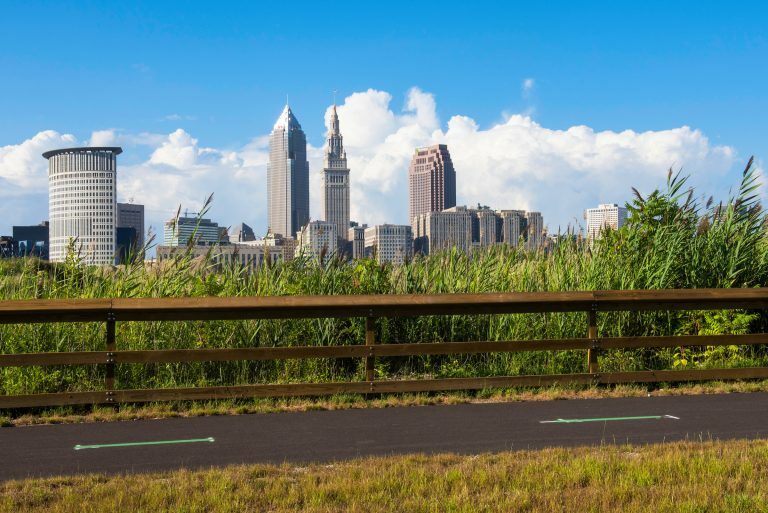 The nearly $8 million Transportation Investment Generating Economic Recovery (TIGER) grant, focuses on filling critical gaps in key shared use trails in the northern section of the Industrial Valley in the Flats and along the western neighborhoods of Cleveland. By building physical connections through trails, bridges and interconnected networks, we’re enhancing mobility, access to work, school or play; and, ultimately, connections to nature. We are continuing to make investments along the lakefront as well. The new Edgewater Beach House provides increased accessibility, amenities and neighborhood connections. Construction will soon begin on the new Euclid Beach Pier, which will feature improved guest experience, accessibility and safety for park visitors. Both of these projects are working in tandem to improve connections with Lake Erie. Originally, needed as a resource to support Cleveland’s bustling industry, recent developments along the lake have attracted an increase in visitors that enjoy various types of recreation such as swimming, water sports and more. I began my role as Cleveland Metroparks Chief Executive Officer in 2010, and it is an honor to lead the Park District at this pivotal moment in our history. Reflecting on the past is a great reminder that the work we do every day can have a lasting and positive impact. Standing at 100 also gives us the opportunity to look to the future, and plan for the next century of growth. As we begin our second century, the Emerald Necklace is now nearly complete. It is now time to focus inward towards the Cleveland city center and our inner ring suburbs. And, as we complete new connections, we’ll continue to preserve our original reservations for the generations to come. Cleveland has incredible and boundless opportunities for growth. So many of these opportunities are about maximizing urban green space, increasing trail connections and leveraging our greatest natural asset, Lake Erie. I am incredibly proud of where Cleveland Metroparks is today, and look forward to what the future brings Cleveland Metroparks. Thanks Brian, I had the fortune of seeing first hand some of Cleveland Metroparks’ extensive system on one of the workshop tours at the recent Meeting of the Minds annual summit. What you’ve all done there is very impressive! Integrating parks and transportation is forward thinking, particularly in terms of equitable access, economic development, and healthy transport. It was interesting to hear how the area’s industrial history had some positive effect on preserving green space by keeping large tracts of land around some industries free from other developments, like housing. Did this make planning the modern regional parks system any easier or were there other challenges to overcome? Brian, you write “In 2013, a Trust for Public Land study identified Cleveland Metroparks trails and parks as key economic drivers that contribute at least $855 million annually in economic benefits to Northeast Ohio.” This is such an important part of why urban and regional parks are important to the future of sustainable and smart cities and isn’t discussed enough. There are major economic benefits to well designed and maintained urban parks. The Metroparks system was one of the main reasons we decided to convene the Meeting of the Minds Annual Summit in Cleveland. So many of our delegates were blown away by the parks system and had no idea Cleveland was such a leader in this space. Thank you.